Our very own Open Source Arduino based Enigma Replica Prototype PCBs are now available! They were created as a Stretch Goal in our recent Kickstarter campaign to meet the numerous demands of backers wanting a fully functional plugboard. 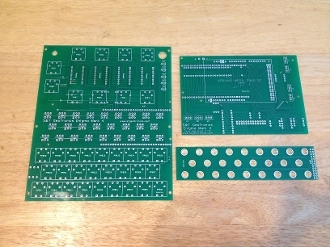 You get all 3 of these PCBs and the Assembly Instructions. Once you acquire on your own the Bill of Materials below, you will have all it takes to easily recreate your own Enigma Replica. If you prefer, you can purchase from us the Enigma kit which includes all 3 PCBs, the Assembly Instructions and every component required to build the electronic portion of the Enigma Replica (no box included).